Sentinel provides customers with the expertise to increase efficiency and reduce the cost of managing low-level offender populations. This allows limited financial and human resources to manage higher-risk offenders. Our professionals deliver a portfolio of offender management programs and services that help to achieve the best outcome for both the agency and the participant. The local agency professionals receive regular updates and reports and maintain oversight authority in accordance with laws, rules, and guidelines. Over the last two decades judges, as an alternative to sending offenders to overcrowded (not to mention expensive) detention centers, have increasingly been sending low-risk offenders home on the condition that they comply with the terms of electronic monitoring programs. Over this same period, Sentinel has become a leading provider of electronic monitoring technologies and comprehensive monitoring services to courts and law enforcement agencies across the country. Sentinel’s case management model was designed to help create community-based programs that offer a full complement of comprehensive service tools. These tools, in turn, can be used by correctional agencies to more efficiently and effectively manage their offender populations. Our experienced case management staff is based locally to better assist in all phases of a participant’s probation period. To that end, Sentinel’s case management program consists of multiple steps that begin when an offender is referred to the program: pre-enrollment, orientation/intake, on-going compliance verification and completion. Our case managers handle the entire spectrum of day-to-day activities associated with verifying a participant’s compliance with a given program’s specific rules and regulations. 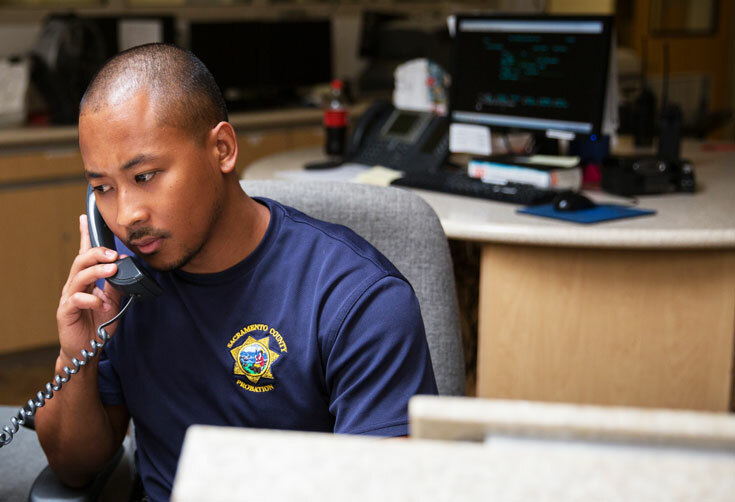 Ultimately, it is the open communication and cooperation between the Sentinel case manager and the law enforcement professional that creates successful outcomes for the participant and the agency alike. All of these solutions are monitored from Sentinel’s state-of-the-art 24/7/365 National Monitoring Center and are supported by secure, web-based information exchange platforms that provide a convenient way to exchange data with the supervising agency. Sentinel’s Centurion Kiosk was developed to serve a number of administrative functions for correctional agencies and provide innovative offender reporting and collection options. Capable of serving a host of different correctional agencies, the kiosk can be stationed in Sentinel Day Reporting Centers, courthouses, jails or any government agency building, making it easy for users to access and quickly complete their transactions. Our drug testing programs are designed to ensure participant accountability while remaining drug-free on the path to recovery. Our trained technicians conduct drug screenings at our local offices, removing the department’s burden of collecting urine samples from those individuals ordered to provide them by the Courts. Utilizing Sentinel’s DNA case management software, the randomization of participant screening and automated testing notification system are built in features available to our customers via access to our proprietary software platform. With courts, law enforcement and community corrections agencies facing on-going budget reductions and fiscal restraints, the ability to collect payments from offenders has become paramount. We recognize that the collection of offender fines, fees, and restitution payments is a major concern, and Sentinel has been working with agencies to address this issue for more than a decade. To facilitate the collections process, we offer multiple payment options that can be coupled with our automated reminder calls and dedicated Collections Call Center. We strive to provide participants with every avenue for payment success, resulting in higher collection rates in the programs we serve. Many correctional agencies require minimal continued contact with offenders who require low-risk supervision. Existing programs often require offenders to mail-in monthly progress reports, which lead to ineffective and inaccurate case records. Sentinel has leveraged technology to create highly accurate yet cost-effective reporting tools that automate much of the administrative reporting needed to effectively manage offender populations.